Enermax has published a power supply unit (PSU) compatibility list which comprises all its current high-end to mid-range models that support Intel ‘Haswell’ CPUs, allaying fears that some PSUs aren’t capable of delivering small amounts of power to support the processor’s new C6/C7 low-power states. According to various online reports, the next generation Intel ‘Haswell’ Core processor’s C6/C7 low-power states require a minimum current of 0.05A (amperes) on the 12V2 line. Some older and budget PSUs may not be capable of delivering stable voltages at such low loads; hence, when the Haswell processor enters its C6/C7 low-power state, the system may shut down due to the under voltage protection (UVP) feature of an affected PSU. For a PSU that doesn’t have the UVP feature, the system may experience hang-ups due to the unstable power delivery of the PSU. According to Enermax, most PSU manufacturers don’t state the possible minimum load of their products. In order not to leave consumers groping in the dark, Enermax has announced its list of PSUs that are capable of supporting the chip’s C6/C7 low-power states. 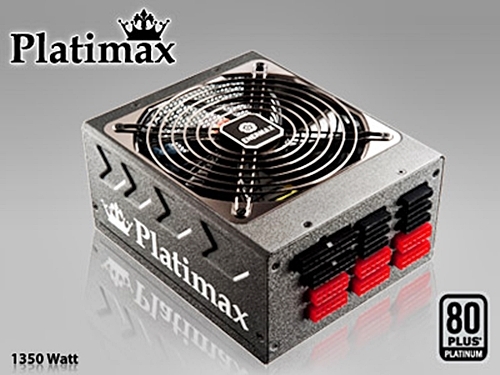 One such power supply is the Enermax Platimax 1350W. The listed PSUs are equipped with a DC-to-DC converter, which enables the ZERO Load Design, and these power supplies will deliver steady voltages even at 0W load. The ZERO Load Design has been implemented in all high-end PSUs since the Revolution85+ series that was launched in 2008. For the comprehensive list of Enermax PSUs that support the C6/C7 low-power states of the Haswell chip, please follow this link to Enermax’s announcement. As a note to our readers, the Intel Reseller Center website has a list of PSUs that can be sorted by minimum 12V2 load, and there are currently twenty three PSUs that appear to be compatible with these new low-power C6/C7 states.